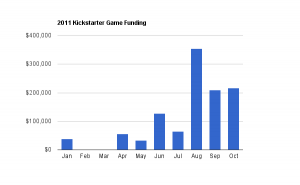 Many in the board game industry are beginning to hear about Kickstarter. It is a micro funding site that allows a person to post a project, set a money goal to be raised, and set a deadline for how long it takes to raise the money. One of the first games to make it big on Kickstarter was Eminent Domain which raised more than $40,000 in November of 2010. This year 61 Games, which includes board games, card games, RPG, and Dice games have successfully been funded with another 17 currently attempting to successfully fund. The total so far for the year as off October 23, 2011 has been $1.1 million in total successful funding. Here is a chart that shows the success of the funding by month. Currently there is approximately $185,000 that has successfully been funded but the time limit has expired, which will boost the total to over $1.3 million so far for the year. I love the Kickstarter concept. I recently received the re-creation of the board game Montage via Kickstarter and am very glad I contributed to the cause. The question is whether this success is sustainable in the long-term. I believe we have yet to see it’s full potential — both because of a growth in audience, as people find out about Kickstarter as a medium, and because new campaigns often pick up on successful features from past campaigns. Another issue is that of quality when it comes to board games; not campaign quality, but gameplay quality. Kickstarter staff screens for the former, but couldn’t possibly handle the latter. As the medium becomes saturated, will an increase in mediocrity (if that becomes the case) diminish the effectiveness of the medium? That remains to be seen. We’re hoping to leverage KS through not only high quality campaigns, but professional marketing campaigns and top-notch products (or first project being a party game called FrankenDie). This kind of approach seems to be what has separated the $5K projects from the $30K+ projects (that and the fame of the producer before the campaign).